By ‘eck it was chilly outside today. I’ve come home early as my plot mojo suddenly up and vanished. We were in Northampton on the weekend and the rain was thumping down, but up at the plot there doesn’t seem to have been that much of the wet stuff. Still, a fair amount’s been done on plot 100. Parsnips are go – 30 holes made in the navy bed with my hoe handle and filled with moist compost (top tip – use a jam funnel to fill the holes, it’s genius!) with 3 seeds of White Gem per hole. 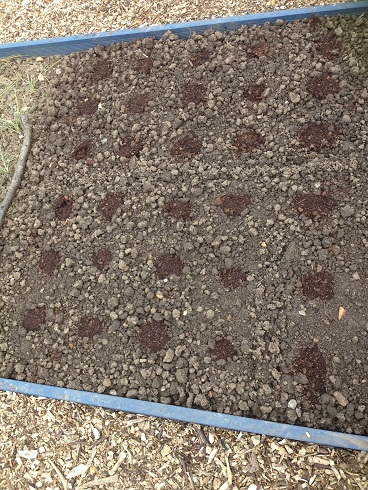 Radishes are in and so are some early marigolds, and the potatoes planted on 4th April are starting to break through the ridges. 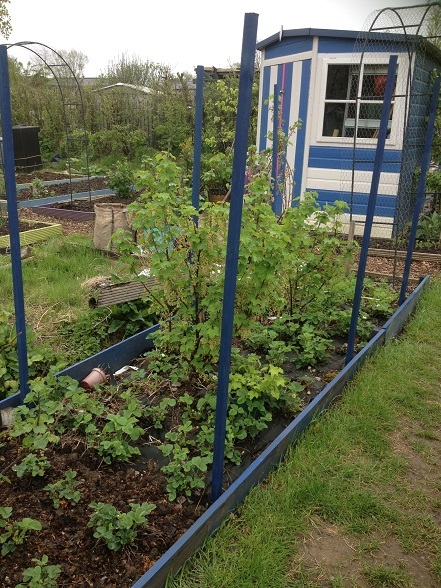 Fluffed the soil in the gooseberry bed by hand – it’s intensely satisfying to run my hands through the soil and break up the clay clods, if not the most efficient use of time. Plot 92 has its own little dalek now too. Turns out I went to school with the person I bought it from – my name’s fairly unusual and sticks in the memory! But it did rain on the way back – which was pretty miserable. I got lots of sympathetic (and not so sympathetic) smiles from other drivers. Thankfully it wasn’t far and I was wearing a hoodie. #92 also has some new clothes – cheap tarps and sheets of cardboard which won’t last long but will hopefully make growing more of a challenge for the weeds underneath. Everything’s doing just fine in the greenhouse and I’ll put some of the DFB plants into the ground soon for an early crop. The others I’ll keep to plant out amongst the goosegogs. I was a bit surprised to see that the small tomatillo plants already have tiny flowers forming. I’m not quite sure where they’re going to go. 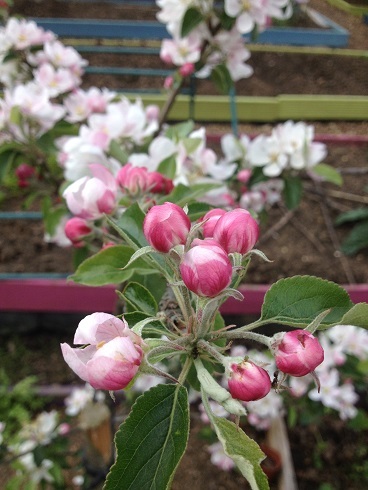 The apple tree is in full bloom and looks like a many-armed pompom. The pear blossom has nearly finished and the trees look like they may even have fruit on them. For the first time. The quince is just starting, though I doubt I will have fruit this year either. It is a very beautiful thing in an awkward space so it’s forgiven being non-productive. I am still umming and ah-ing about getting a medlar in the T&M weekend bonanza. It might be a tree too far. And I still want a damson too. I need to sow more seeds – my plan for April is nearly all ticked off, but I can’t seem to get the ooomph together to sow the final batches, or to pot on the things that need to be in a bigger home. Roll on next weekend.